Sooner or later everyone has to move house. As one of the UK’s largest international moving companies we help move 10,000 people each year around the world. Our most popular destination for our customers are Australia, Canada, New Zealand and the USA. Unlike many of our competitors we only focus on international moving, this means that all our crews and office based staff are experts in international shipping. Our excellent reviews on Trustpilot reflect how highly customers think of us and we have even been entrusted to move members of the British Royal Family! John Mason International have also been awarded the FIDI FAIM accreditation, only awarded to companies who have been independently audited and who have proven that they satisfy the most stringent industry-specific standards of customer care. We are also members of the BAR. Sooner or later everyone has to move house. Just within living memory the very oldest amongst us may recall moving house and piling furniture in to the back of a horse-drawn cart or van. For most of us however moving has meant calling a modern removal firm to collect our tables and chairs, TVs and fridges and take them away in a high sided motor van especially designed for the job. 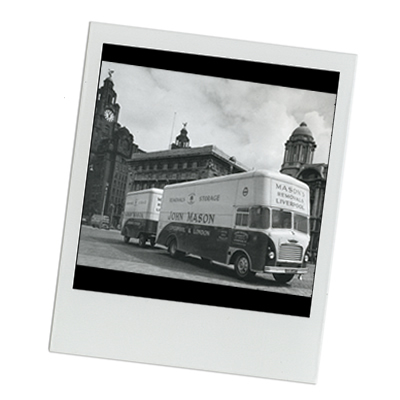 Around Liverpool one of the most familiar sights are the vans of the removal firm John Mason International Ltd. And if you aren’t old enough to recall removals being made by horse-drawn vehicles there were certainly many members of the Mason family whose memories went so far back. The company was founded in 1884 by Mrs Mary Mason in Wavertree, a township then on the outskirts of Liverpool. Before starting out on her own Mary Mason had earlier helped her husband John in his carting business. When Mary’s son, also John, began helping her in 1887 coal deliveries became the main activity. In 1890 Mary’s, by then, 17 year old son took over and expanded the business into a general carrying. In that same year a contract was signed with a local company that was to last for 68 years. John Mason had seen the need for a general carrying service and though at first he had only a pony and cart he expanded the small business by offering to carry anything anywhere. The firm’s early records show that a wide variety of goods were carried including laundry to and from the large houses of the wealthy merchants who then lived in the residential districts of Wavertree and Woolton. One of the early contracts was to carry laundry for the Liverpool School for the Blind between its Wavertree and Liverpool establishments that contract would be held until 1958 when the city establishment was closed. John Mason married Mary Hannah Baker in 1897 and from then on she assisted her husband with the clerical and book keeping work she would later continue to do for her sons in their turn. Soon more vehicles and heavier horses were acquired. 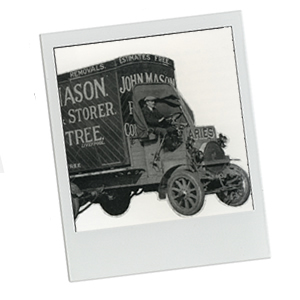 Furniture vans were built to John Mason’s requirements. From the small firm’s base at 85 High Street, the Mason family home, the first long distance removals were undertaken in 1900 using horse-drawn vehicles. Early customers included the Anglo American Oil Company which would become Esso, the Cheshire Lines Railway Company and the English Margarine Works. When work started on the Liverpool Anglican Cathedral in 1904 the aptly named John Mason carried much of the carved stonework for Morrisons Ltd, the firm given the contract to build the Cathedral. Soon the firm’s activities had extended not only to Liverpool but to Manchester, many parts of Lancashire, Cheshire and North Wales using horsedrawn vehicles, whilst longer distances, those over 50 miles, were covered by rail. The city of Liverpool was growing and as new districts were being developed contracts were obtained from the City Corporation to carry material to and from the new roads being constructed around the rapidly expanding city. John Mason was a man of great energy and enterprise never afraid of hard work – if necessary doing so round the clock. He also had a great passion for horses and his only hobby was buying and selling them for himself and for others. John Masons judgement was so respected that he bought and sold horses for a number of the principal dock contractors, and Lord Sefton even entrusted him with commissions to buy horses on his behalf. John would regularly spend a day each month at the Craven Arms Horse Repository and he was also keen on entering his horses in agricultural shows where his horses won many prizes. By the outbreak of the first world war in 1914 John Mason had built up a thriving firm engaged in coal retailing, general haulage and household removals and, although the shortage of horses during the war, would restrict business John’s astuteness ensured that the business did not falter. In 1917 the business moved to 127, High Street, Wavertree gaining more space for both warehousing and stabling for the firm’s horses John and Mary Mason’s eldest son, Leslie, born in 1904 entered the business in his early teens, he would play a full part in the firm for almost fifty years. 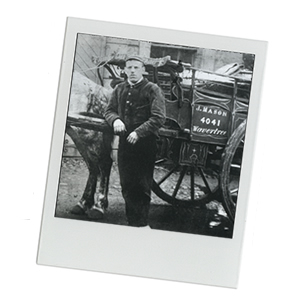 Leslie had shown an early interest in the business from childhood and at the age of only 12 was already helping by driving a pony and wagon like his father before him; by the age of 16 Leslie was driving a team of horses helping to overcome the wartime manpower shortage and enabling him to learn the business from a practical point of view. In 1921, when the first motor vehicle was acquired, an Albion, it had solid tyres and a chain drive. Although more motor vehicles would be steadily added to the fleet horse transport would still be the main form of transport for some time, and more horses continued to be bought for many years. It would not be until almost the outbreak of the second world war that all horse-drawn vehicles would be replaced by motor vans, platform vehicles and lift vans. Meanwhile with the increasing help of Leslie Mason the business developed and its reputation for good workmanship and the personal attention and courtesy of its employees became ever more widely known. By 1926 the first lift vans for rail were bought and overseas removals agents were appointed to look after the firm’s interests abroad. A year before the outbreak of the second world war in 1938 John Mason’s second son Stanley joined the business. Born in 1921 Stanley would play a major role in developing the company but his practical training involving driving and packing was interrupted in 1941 by him being called up to serve in the Merchant Navy for the duration of the war. As in the first world war domestic moves were much reduced, though contracts gained from the government helped keep the business going despite both a manpower shortage and petrol rationing. The second world war which brought to an end the era of the horse-drawn vehicle saw the firm’s motorised vehicles being called up for war service. One of the many interesting jobs undertaken was the continuous removal of the Royal Liverpool Philharmonic Orchestra’s instruments around the country enabling it to continue to give regular performances. The orchestra gave many concerts to troops and civilians during the war years; Mason’s driver Bill Clarke was never late for a concert even though he had to contend with all the hazards of the black out and enemy bombing. During the war ‘Masons’ did vital work evacuating schools, institutions, government departments, commercial and industrial concerns and homes. Munitions and other war equipment were carried, whilst to meet the call for decentralisation extra warehouses were acquired on the outskirts of the city and at Penmaenmawr, in North Wales, for furniture storage. Each evening Mason vehicles reported for duty at Civil Defence and Fire Posts. During the intense bombing of Liverpool the Mason team played its part. The end of the war brought with it the enormous problems of rebuilding after the destruction of the blitz. Industry and commerce had to be reorganised to meet the needs of the post-war world. The Mason brothers, with hard work and foresight, made great progress. Large office removals were undertaken and a considerable contribution made to the transport services required by the vast rebuilding programme which would take place. Weeks of pre-planning were necessary in some cases for the removals of private and government offices to ensure the minimum disruption of office routine, and several had to be undertaken at weekends. Many hundreds of tons of files, papers and office equipment were involved in one of the largest moves during which the Inland Revenue, Ministry of Food and other Ministerial offices were moved from LLandudno to London. In 1948 a daily removal service from Liverpool to London was started; London depot facilities would be eventually acquired from FL Pettman Ltd to facilitate distribution in the London area and return loading and by 1950 the company became one of the founder members of FIDI – the Worldwide Federation of International Furniture Removers. John Mason, who had retired at the end of the war, died in 1953 after which Leslie and Stanley became managing directors jointly running what was now a company. 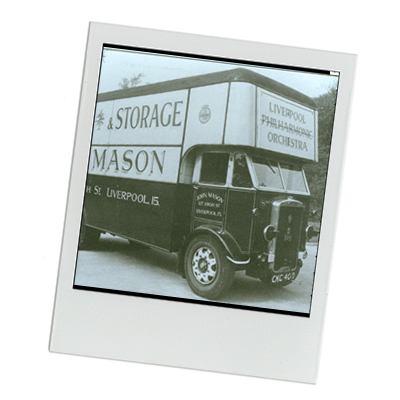 In 1948 the business had grown to such an extent that the private limited company of John Mason (Wavertree) Ltd had been formed with John and Mary Mason and their sons Leslie and Stanley as its directors. To ensure reliability all vehicles had always to be kept in first class condition so that delivery promises could be honoured. Now the fleet and equipment would be kept constantly up to date by the purchase of new vehicles. Steady expansion of Mason’s service was made to cover the whole of the United Kingdom. During 1955 a daily removal service to Ireland using the Preston/Larne Roll on-Roll off ferry commenced and, combined with the daily Liverpool/London service, offered the quickest route available from the capital to Ireland. 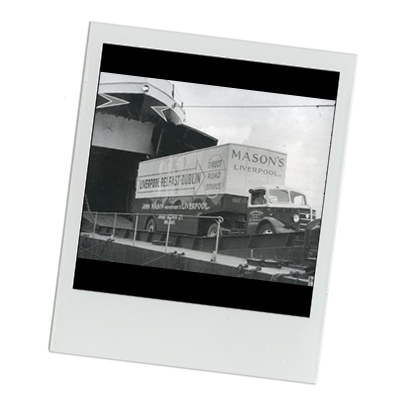 Mason’s would be one of the first removal firms to use the ferry service from Preston, and at the time the only firm in the north west offering an almost daily service to Ireland of articulated trailer vans, a service offering considerable savings in packing and handling costs since loading on and off the ferry by cranes was no longer needed. To give a more local service in Cheshire in 1955 Leslie and Stanley became directors of B Dudley & Sons Ltd Removers of Bebington, a firm established in 1869 and both companies worked in close association. In 1959 Dudley’s would be taken over completely by Masons. By the closing years of the 1950s Masons, in association with four reputable South of England firms, had also established a network of distribution routes serving the Midlands, the South West, the South East and the South of England as well as many parts of Wales, Lancashire and Yorkshire. In 1959 a new 16,000 sq. ft warehouse was opened in Wavertree, built to the company’s specifications and specially designed and constructed to store customers’ effects with the highest possible degree of safety. By 1962 the continued growth of the company resulted in the purchase of a 36,000 sq. ft warehouse in Kirkby. The company launched into the antique shipping business which required large consolidation and storage facilities. By 1967 a further 2,000 sq. ft warehouse was acquired bringing the company’s total Merseyside facilities to 72,000 sq.ft. Stanley Mason was elected President of the Overseas Division of the British Association of Removers in 1965. Sadly 1971 began with Leslie Mason’s death, following which Stanley’s wife, Jean, joined her husband as a director; they were joined in 1972 by their eldest son Paul. In 1974 the company joined Eurovan, a consortium of around 180 mainly privately owned international removals companies and by 1977 a record volume of antique shipping was recorded – some 250 ISO containers were packed and despatched from the company’s warehouses. By 1982 that success was consolidated with a record year for inter-continental removals: over 400 containers were exported winning the company the Eurovan ‘Biggest Booker’ award. The following year, in April 1983, Stanley Mason died and his son Paul now joined his mother Jean as a director of the company. More than a century of successful trading has been achieved not only through the hard work of the directors but very much because the company has always enjoyed a completely loyal and hard working staff. Their contribution above all else has played the central role in the growth and development of the business. It was in that spirit that the firm entered its second century in 1984. In 1989 all the company’s local activities were transferred to Wilson Road, Huyton whilst a new warehouse and offices were opened in Croydon. Today international removals, as well as commercial and household moves and storage are at the core of the firm’s business. 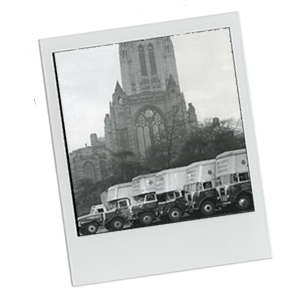 The prestigious removal firm Mason’s currently facilitates over 8,000 removals each year across the globe. 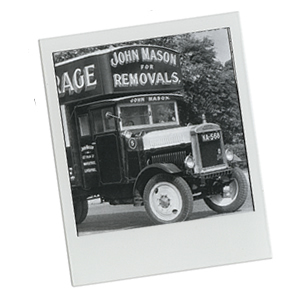 From a single horse and cart and undertaking only local work, during the course of many decades the firm of John Mason International Ltd has grown into a major player on the world stage for overseas removals. But despite its massive growth the firm has still managed to retain the virtues of a small family firm: flexibility, a genuine appreciation of its employees and an unswerving commitment to meeting its clients’ needs. As one of the UK’s leading International Shipping and Removals companies, you be assured that we will take the stress out of your relocation.